A common real estate transaction is one that involves using home equity to make an additional investment. When done wisely, leveraging home equity can be a wonderful investment with many great benefits. But like any investment, there are risks involved when it comes to dealing with St George home equity. One must equip themselves with the appropriate knowledge and be smart about what strategies to take. First of all, what is equity? It’s the difference between how much a property is worth and how much is still owed on the loan. For example, if a $500,000 home had a $250,000 outstanding loan on it, the St George home equity would be worth $250,000. So when and how should St George home equity be leveraged, and how much? The type of investment that a person chooses to make using a percentage of their equity is up to them. Lenders typically set a limit on the percentage of equity that a homeowner can use – usually around 80%. This is because the lender wants a buffer to exist just in case interest rates or property prices suddenly fluctuate, or the loan unexpectedly needs to be discharged. These limits instituted by lenders allow them protection from risk. Revisiting our $500,000 home example – let’s assume that the lender has an 80% limit on equity usage. This means the amount of St George home equity available to the homeowner for investment would be $200,000 (80% of $250,000). The process of using money from St George home equity is not as complex as the loan application procedure due to the fact that the property now exists as security to the lender. The value of the property will have additional funds borrowed against it assuming that the lender considers both the loan suitability criteria and credit assessment satisfactory. The method by which the homeowner pays the mortgage will not change. The difference is that the value of the property can be dipped into for whatever uses the homeowner has in mind. A new contract – called a line of credit loan or a home equity loan – will be signed. 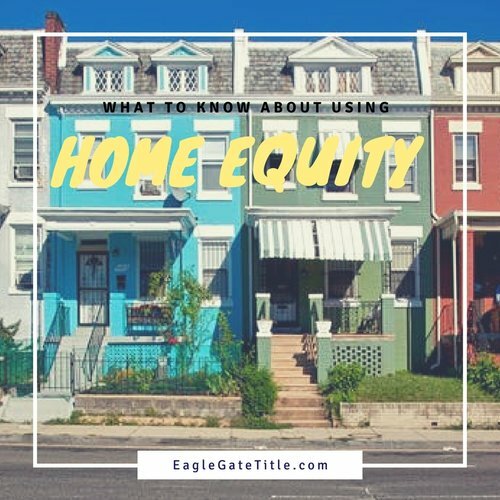 To access your equity, there are a few different avenues that can be taken, such as a mortgage refinancing, additional advances, and redraw facilities. For further information on these topics contact a representative at Eagle Gate Title. Remember that there is financial risk involved when tapping into your St George home equity. The property market changes continually and unexpectedly despite meticulous calculations. 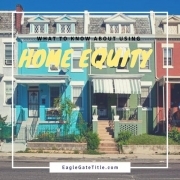 When you leverage home equity, you’re risking the chance that you may not get a return on your investment, or that the existing property may not maintain its capital growth. Also important to remember is that percentage of the property that you own decreases when funds are borrowed from your St George home equity. The reason we mention these potential negative possibilities is to persuade you to be thorough in your market research and in the understanding of your personal finances so that you you account for as many potential risks as can be foreseen so that you feel comfortable with your final decision to invest with your St George home equity. On the positive side, in addition to the hopeful success of your investment, there are tax benefits when homeowners use portions of their home equity. The interest that is paid on it is tax deductible in some cases. We recommend that you communicate with your tax advisor or accountant on this aspect of tapping into your St George home equity. They will be able to help you with your decision- making process from their perspective.